I'm missing the wineries of the Santa Ynez area. While searching through my holdings I came across this bottle which brought back so many memories of travels to the that area and to Beckman Vineyards in particular. Since it's first offering Beckman has been a producer of extremely well made Rhone varietals. 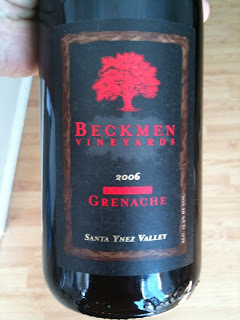 Their Syrahs tend to be superb so this Grenache should not disappoint... and it it didn't. This wine is made from 100% Grenache from the Purisima Mountain Vineyard in the Santa Ynez Valley, barrel aged in 100% neutral oak so you get the full varietal experience. The nose on here is beautiful, full of red fruits (strawberry is the standout for me with maybe a little cranberry) along with a touch of vanilla. The wine is medium acidity, medium bodied with lovely black cherry along with hints of dark chocolate and spiciness on the tongue. Well made, well balanced, medium/(+) length finish all made this a lovely wine. If you have a bottle, drink it now.